Imagine having every single lecture your teacher gave ﻿on your iPad ﻿or MAC computer. Imagine having interactive Powerpoints that illustrate every problem, walking you through the procedure step-by-step. Imagine having every proof, illustration, or theorem explained concisely and accurately. 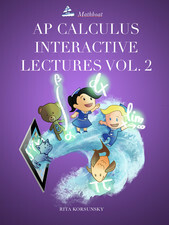 This Book contains immersive and comprehensive Powerpoint presentations for every topic covered by the AP Calculus BC classes. They can be used for both review and learning, a perfect fit for every student no matter their current knowledge of Calculus. With these Powerpoints you will have every concept you need to know at the tip of your fingers. This book is only for AP Calculus BC students. Calculus BC students also need Volume 1. At the end of this book, you will find the list of all the formulas and theorems needed for the AP test. This ﻿﻿Interactive iBook ﻿﻿has all of the tools and teaches you the tips and tricks to master Calculus in no time. The best way to learn is not to just study harder - the answer is to study smarter. Get a free sample of the ibook version for ipad! Also available: Kindle and Paperback versions of this book. The title of this book in both Kindle and Paperback formats is "AP Calculus BC Lecture Notes". The﻿ ﻿Kindle version﻿﻿ is very convenient! You can download it on your mobile phone and it will travel with you everywhere you go! You can learn Calculus anytime and anywhere you want! The Paperback version includes both AB and BC curriculum. It is awesome! You can take notes on this book, study from it, and use it as a test preparation tool for chapter tests, as well as for the AP exam. "The past year is my first time to teach BC Calculus. My school bought the PPT version of the lecture for me and the class set paper copy for my students. It helps me to explain the difficult concept to the students. Great help to me and my students." -HG. "Out of eighteen BC (technically AB/BC in one year) students, I had fifteen get a 5 and three got a 4. I used the multiple choice questions for test questions and the AP Calculus BC Lecture Notes for either notes or my own studying. They were both extremely helpful!! I would recommend both! "- Karen S.
This is a valuable resource for every high school student who wants to learn AP Calculus BC. The lessons from this book helped me greatly. I highly recommend this book to everyone.”- Lawrence C.
"This book is very helpful when preparing for the AP Calculus BC exam. The notes are very clear and easy to follow. The book also contains a plethora of problems which cover all of the topics that appear on the AP Calculus test. Completing this book enhanced my understanding of calculus and helped me get a 5 on the AP test." -Richard H.
"This book explains the complex concepts of AP Calculus BC in a clear and concise way. The notes are understandable and explain the topics well. This is no doubt an incredibly useful tool for both the AP Exam and the class. The cute visuals keep it interesting and this is definitely an important resource. It's also well-organized and easy to use. Overall, I would highly recommend this book if you want to gain a thorough understanding of AP Calculus." -Pallavi C.
"The notes do an excellent job of covering all the material on the AP exam. It is fully up to date and provides more than enough information to be successful on the exam. With the help of these notes, I was able to score a 5 on the AP exam." -Aryan S.
"The PowerPoints are clear, concise, and easy to follow. Clear diagrams and many examples with solutions clearly explained. Pictures and cartoons in the book keep the lectures entertaining and fun. Great for both self studying and for supplemental study material to help prepare for the AP exam or for class." -An Li. "This book is comprised of consummate and thorough lectures, which cover every topic in the textbook...and more! The visual approach to the lectures helped with keeping the material engaging and memorable. The formulae at the end are also super useful. With it, I easily scored a 5 on the AP exam! Great book." -David Y. "This is an excellent guide for both students and teachers. As someone teaching AP Calculus for the first time, I found this book to be invaluable and very user friendly. I would recommend everyone visiting mathboat.com as well and see all the items Rita has to offer. She is fantastic." "The lectures in this book are incredibly useful, and they make the complex calculus subject much easier to learn. AP Calculus is a rigorous course, but the detailed lectures greatly helped my progress. I especially like how there are so many specific examples for each concept and chapter that work out the problems step by step, showing the thorough yet precise procedure which is the best solution. The anecdote about Pi and the other characters are also very cute and amusing, and their experiences are very relatable—as a student whose dream is to land a good college. The book is also neatly organized by chapter, making it easy for the reader to search for the area in which he or she needs more help. In essence, this is definitely a great book, and I would recommend it to anyone who seeks to prepare for the AB Calculus BC exam(or whoever simply wants to study some calculus!). "- Catherine C.
"This is a clear, comprehensive set of lecture notes that included everything I needed for the AP Calculus test, covering the topics very thoroughly. I definitely couldn't have gotten a 5 on the AP test without this book. It was integral to my studying." -M.C. "So helpful. Used this to study and got a 5 on the AP test." Amanda D.
“This volume and its predecessor are essential to understanding the challenging concepts of Calculus BC. Not only was I able to further my understanding through the indepth explanation of each solution, I was also able to gain insight on the types of problems they ask on the AP Calculus BC exam. The presentations also have clear graphics and cute characters. These lectures are a must for any calculus student.”- Asma M.
This set of lectures is just as good as Volume 1, with beautifully explained concepts and lots of example problems. I highly recommend this book to anyone aspiring to get a 5 on the Calculus BC exam.”- Meera K.
“ The material is presented in a way that is clear but not overwhelming, allowing the student to keep up at a steady pace. The book manages to combine valuable information with an interesting twist to keep it lively, a must-have for any diligent student.”- T.P. “…this book is more than just a thorough review of AP Calculus BC as it …goes above and beyond in presenting the formulas and concepts in an engaging fashion designed never to be forgotten. I highly recommend this book for students, parents, and educators alike.”-V.X.